In this hilarious clip Rowan bumps into something seemingly innocuous while sweeping the stage. This world famous clip sees him play an invisible drum kit. Whether mesmerising us with the sheer visual mastery of Mr. Bean, beguiling us with the acerbic wit of Edmund Blackadder, or simply entertaining us as the suave, but rather hapless British Secret Agent Johnny English, you surely won't have escaped the comic genius that is Rowan Atkinson. 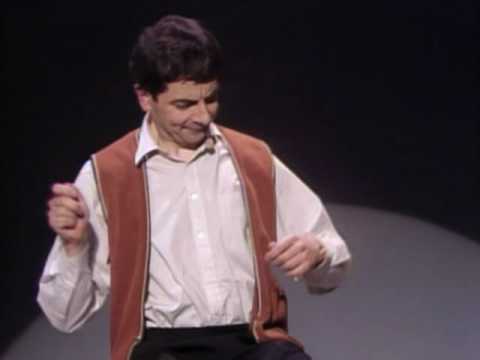 In Rowan Atkinson Live, co-written with Richard Curtis (4 Weddings & a Funeral, Notting Hill, Love Actually) and Ben Elton, Atkinson runs the whole gamut of his remarkably versatile 30 year career, with sketches, mimes and monologue's that are guaranteed to have you shedding tears of laughter. Performing live on stage alongside "straight man" Angus Deayton, the show features a number of original and familiar routines, including sketches that appeared in the original Mr. Bean series.